This picture will change on Thursday. It’s taking a lockout of the National Football League’s referees to make it happen, but on Thursday, Shannon Eastin, who has officiated football games for 16 years, the last four in the Mid-Eastern Athletic Conference, will be the first ever female line judge when the Green Bay Packers play the San Diego Chargers in a preseason game. Her arrival, even under politically loaded circumstances, is a big deal for a male-dominated sport that often ignores its strong, passionate female fanbase, and for professional sports in general, which has been slow to integrate women into executive, coaching, and commentator roles. In television coverage, women are frequently relegated to sideline reporting rather than booth commentary. And while it’s possible to do substantive reporting on the ground (as NBC’s intelligent sportscaster Michele Tafoya does), sideline reporters are often stuck on puff pieces about stadiums or lifestyle stories or taking stock answers from athletes who would understandably rather concentrate on the competition than chat. When it comes to more direct involvement, women are even less visible: When Linda Bogdan, the daughter of Buffalo Bills owner Ralph Wilson, died in 2009, she was the only female scout in the NFL. Baseball’s done a little better, but Kim Ng, the senior vice president of international operations for Major League Baseball, is still the highest-ranking woman ever in the sport, and if she becomes a team’s general manager, she would be baseball’s first. Because the referee is the ultimate authority in a game, it’s one of the most important positions for women to occupy, a signal that they are expert enough not just to comment on sports, or to recruit players, but to actually make the final calls. It took until 1997 for the NBA to allow Violet Palmer and Dee Kanter to referee regular-season games, and only Palmer still works today. In 1973, Nora Ephron profiled Bernice Gera, the first woman to call a professional baseball game, in Class A in 1972, who had to fight four years of legal battles to umpire and was harassed so badly along the way that she quit after that lone outing. Forty years later, no woman has ever been an umpire in a Major League game, and the closest one has ever gotten is Pam Postema, who umpired MLB spring training games. Thus far, the resistance to Eastin officiating has been based, fortunately, not on her gender but on her experience. 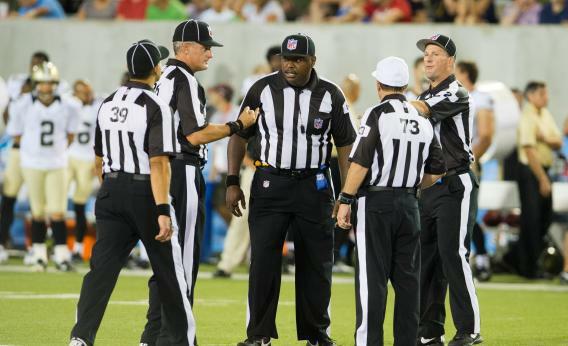 Referees aren’t supposed to arrive in the NFL until they’ve had 10 years of officiating experience, and at least five of them on the college level. Eastin is a year short of that credential, and she’ll have to overcome a broad suspicion among sports fans that the replacement refs, no matter their gender, are underqualified and likely to blow calls that the locked-out pros would have gotten right. But if Eastin calls a clean and respectable game, she could make it easier for the other women who are now preparing in the college football pipeline by demonstrating that gender has nothing to do with a person’s ability to patrol the line of scrimmage. By selecting Eastin, the NFL’s already made the long-overdue point that gender is irrelevant. If she does as well or better as the other men called up as replacements with her, we can only hope fans will reach the same conclusion.